Thread: I did a thing. Been a rough week of Miata ownership. 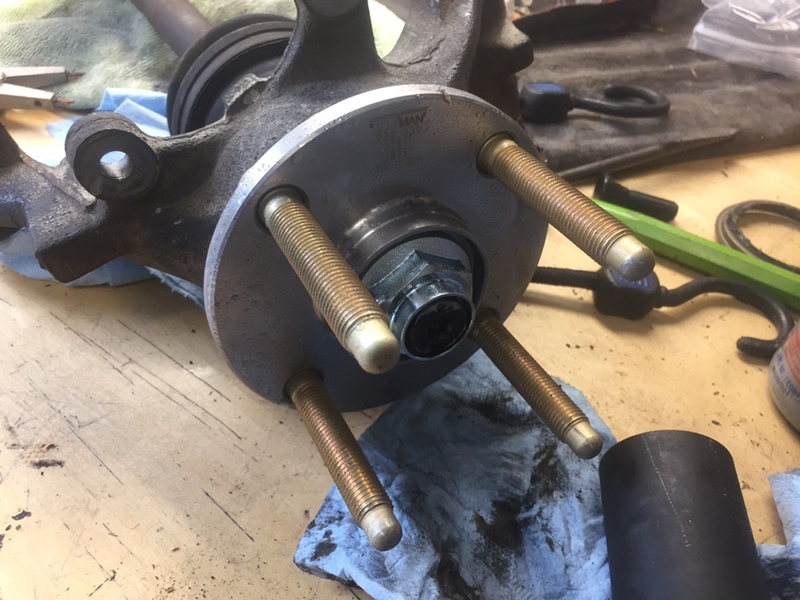 The FR upper balljoint popped out of the UCA today. The car came with stout aftermarket (V8 Roadster?) units that were pressed and tack welded. The three tacks were busted and the BJ popped through. I took off the UCA this afternoon and got it back in with the new press. I wasn’t comfortable reinstalling the assembly without welding it, so I put a few feelers out to source a UCA locally. 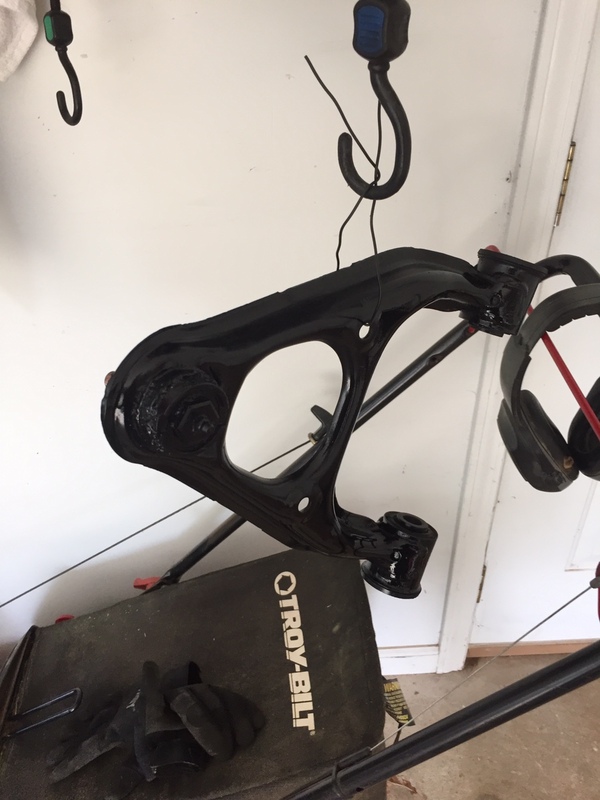 A quick coat of paint, new grease, and a PU boot I had from an old project, it was good to go. 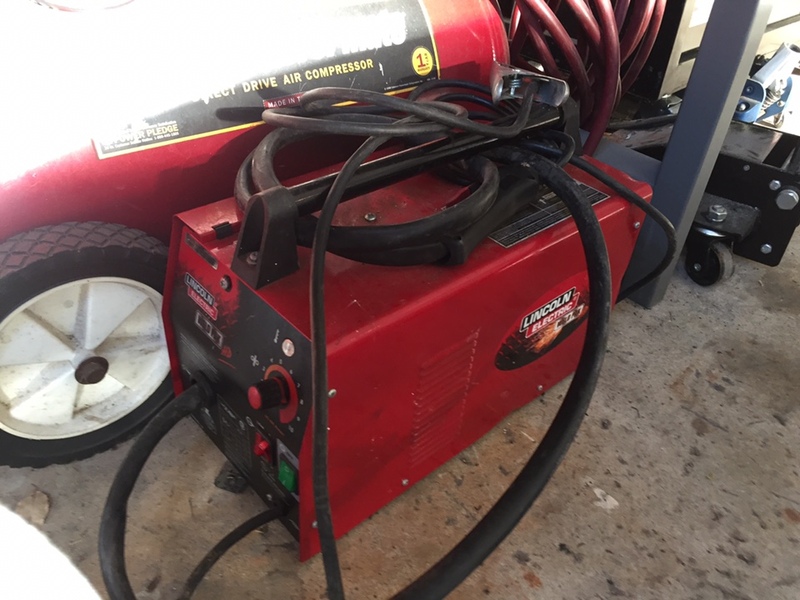 Best part, because my friend is moving away next month he gave me the welder. 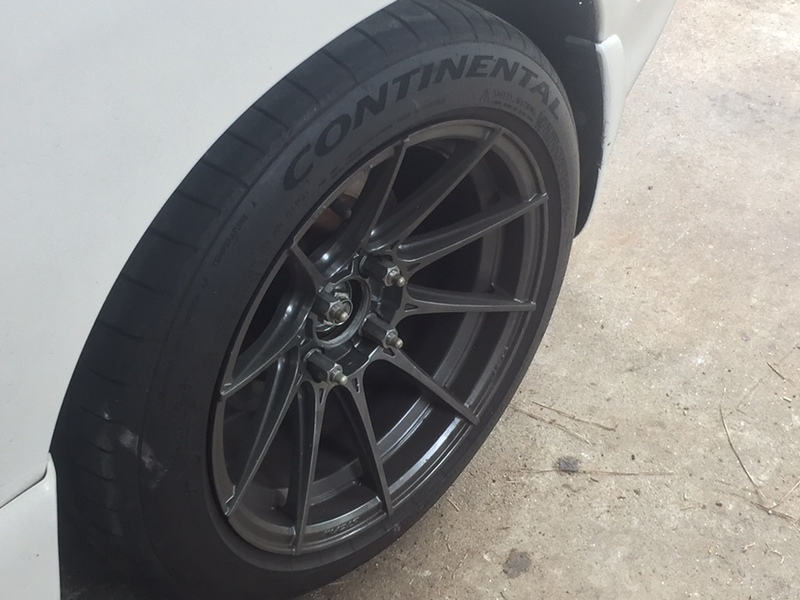 I’ll look for another pair of UCAs in the near future and will probably use Supermiata UBJs. This should do for now. Now you’ll have to get one and park it next to your new press. Orange;228913]Now you’ll have to get one and park it next to your new press. Be sure to get a good one. I got a couple cheepies from Harbor Freight and they're ridiculous. I suppose being a welder for 22 years using industrial grade welders has spoiled me, but dayam man! At least 220V... the 110/120v aren't worth bothering with. Almost responded with that but sometimes alcohol can impair the best of us. Corvette much? xD. I thought I was misreading for a while...he's getting a free one...why get another? What is this, Elder Abuse Day?? No, don’t run away because I have ninja training and will knock you the hell back to 1985 with my HurryCane. I’m not running. 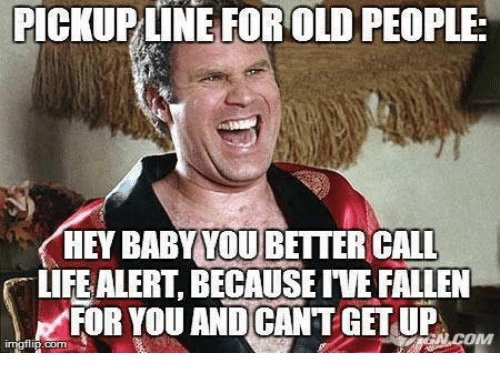 I wouldn’t want you to bust a hip or fall so you couldn’t get up. 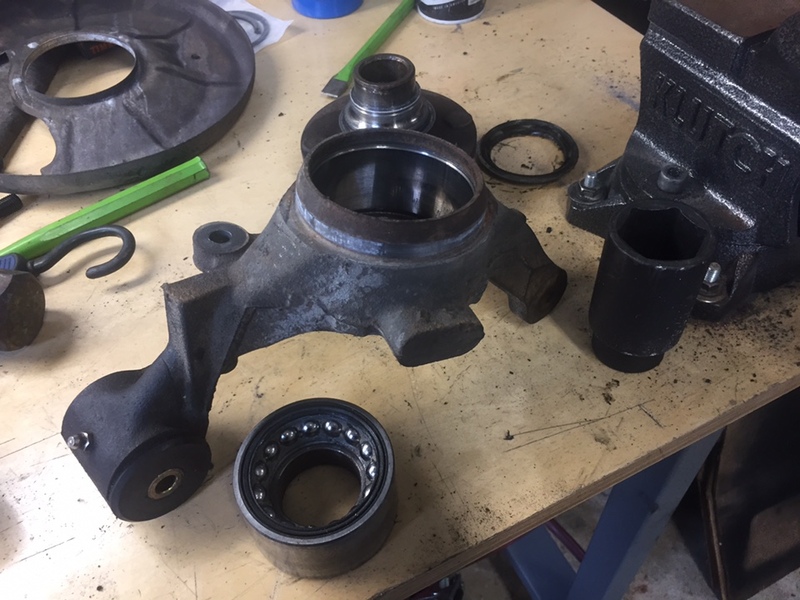 Finally made some time to get the hubs and bearings swapped out. 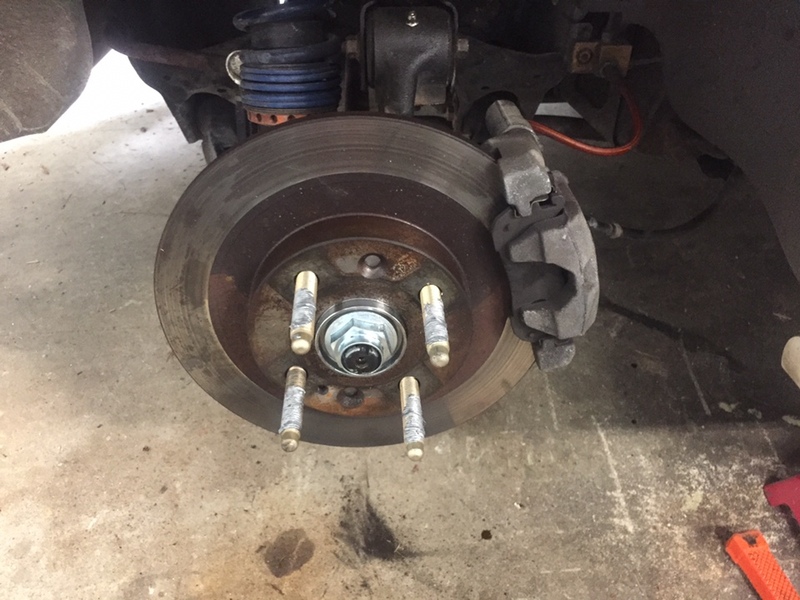 The passenger side, the axle was stuck in the old hub. 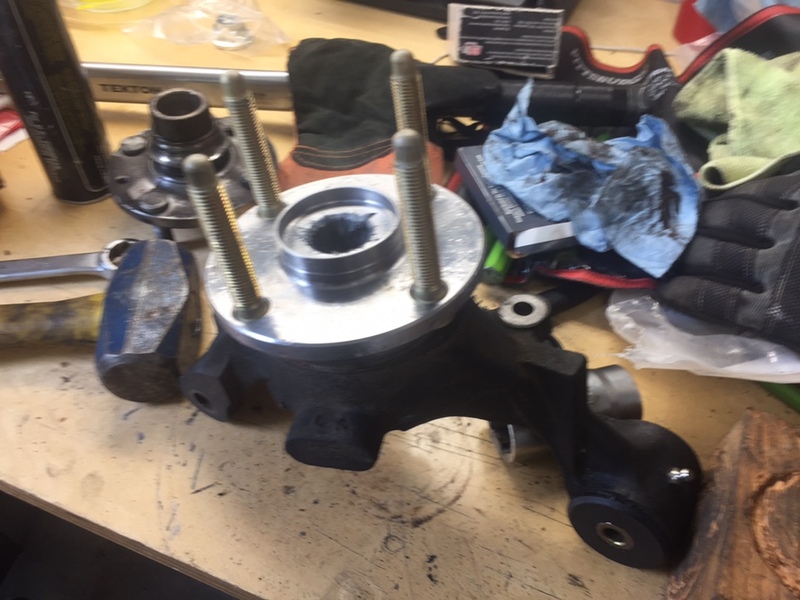 Not uncommon, but it did raise a worry I would have to replace the knuckle and axle if I couldn’t get it apart. 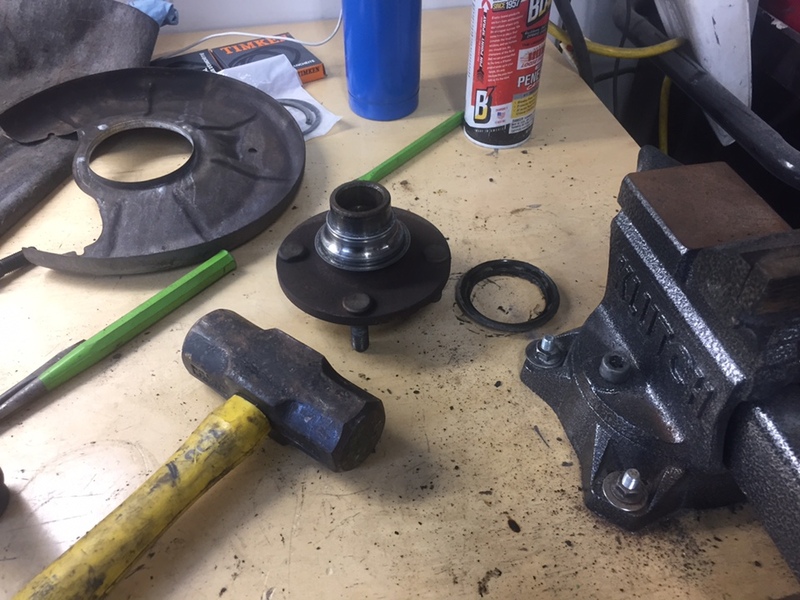 I wound up removing the axle from the dif, still attached to the knuckle and hub, and used a little heat from a basic propane torch and PB blaster, including a 3# hammer with a tapered punch. It wasn’t as bad as I anticipated. 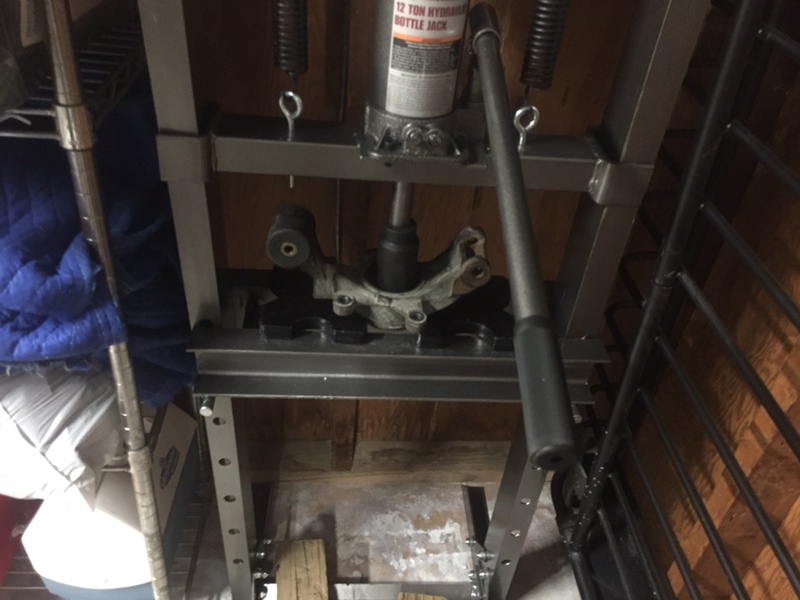 I hung the assembly from my bench vice to get a better position to do that. Because I am replacing hubs and bearings, I didn’t have to worry about getting the inner bearing race off the old hub. 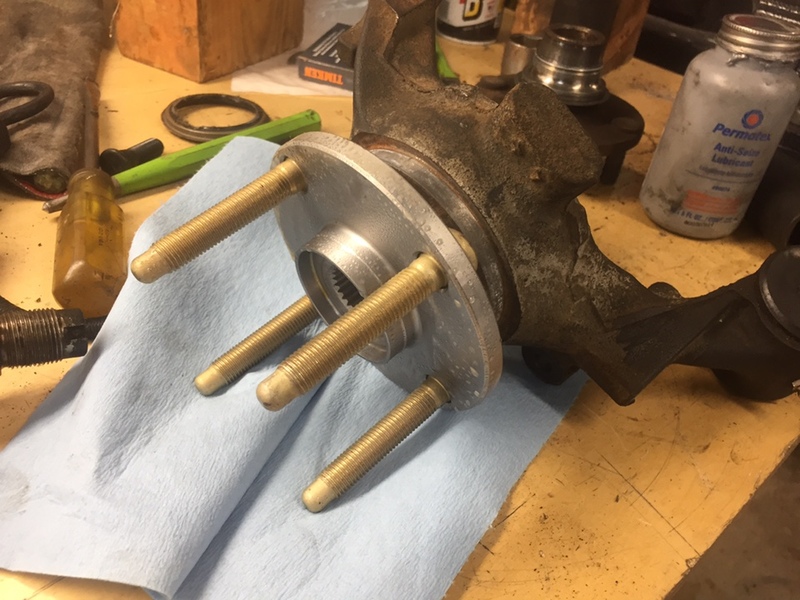 I put the bearings and the hubs in the freezer to shrink them a little an facilitate their installation. Start to finish, even with the sticky axle, the passenger side took two hours. 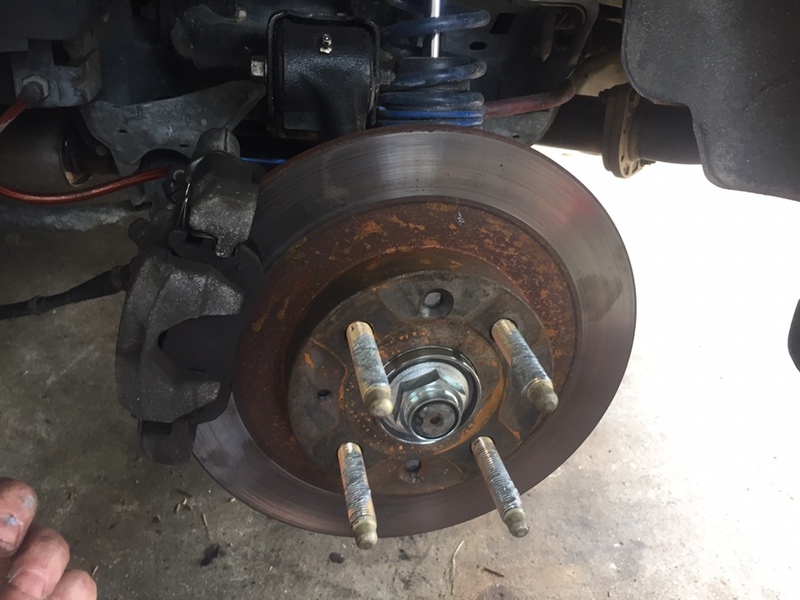 I left the brake dust shields off because I didn’t deem it was much help to reinstall them for my purposes. The sticky axle. This received a healthy coating of anti-seize before reinstallation. 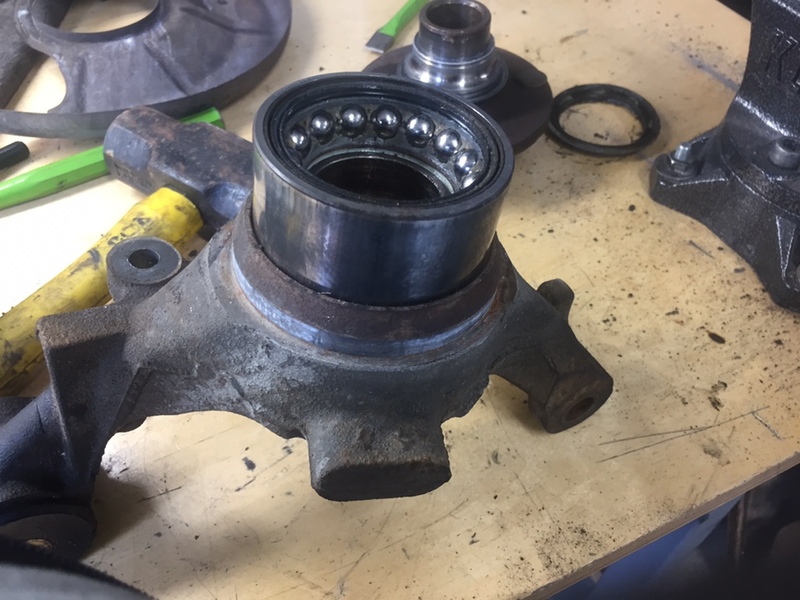 Pressing out the old bearing. 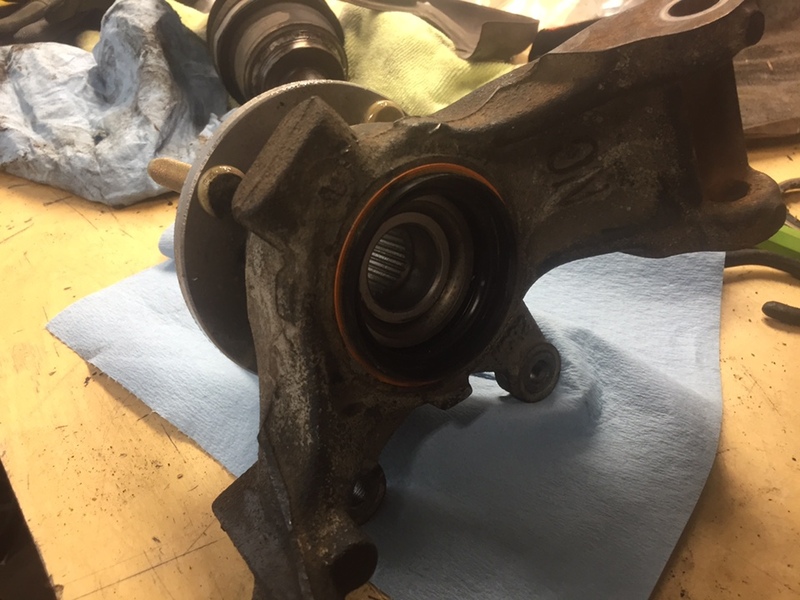 This wheel bearing had become VERY loud the past week, it was dying fast. It’s final contribution was to help press in its replacement. The sleeve of the knuckle was very clean and corrosion/defect free. 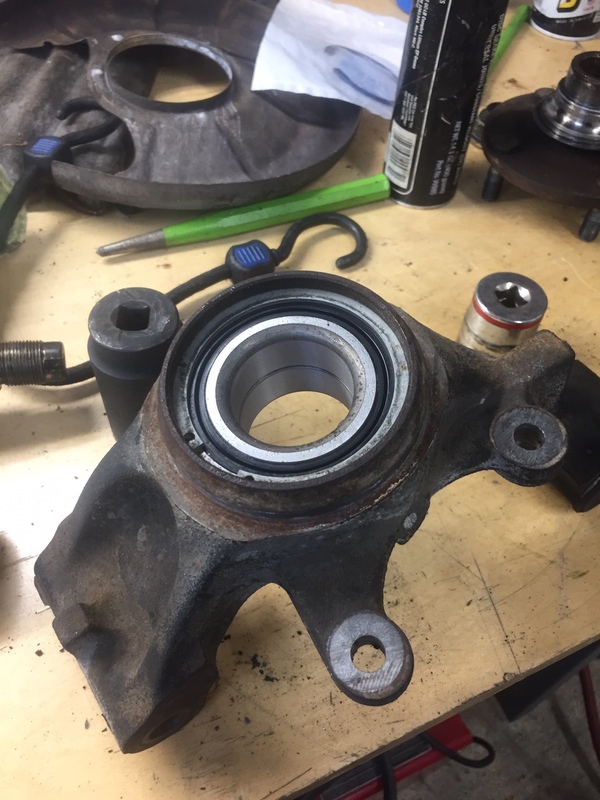 New bearing pressed in. I didn’t take pictures because I was trying to get the ice cold one in the knuckle before it had a chance to expand. Freezing it definitely helped. 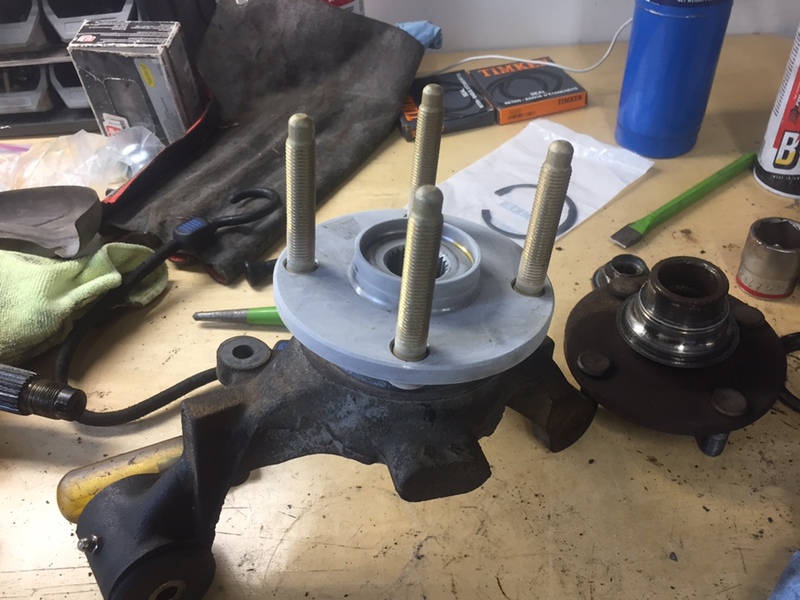 With the bearing closer to room temperature, I took the hub out of the freezer to press it through the new bearing. 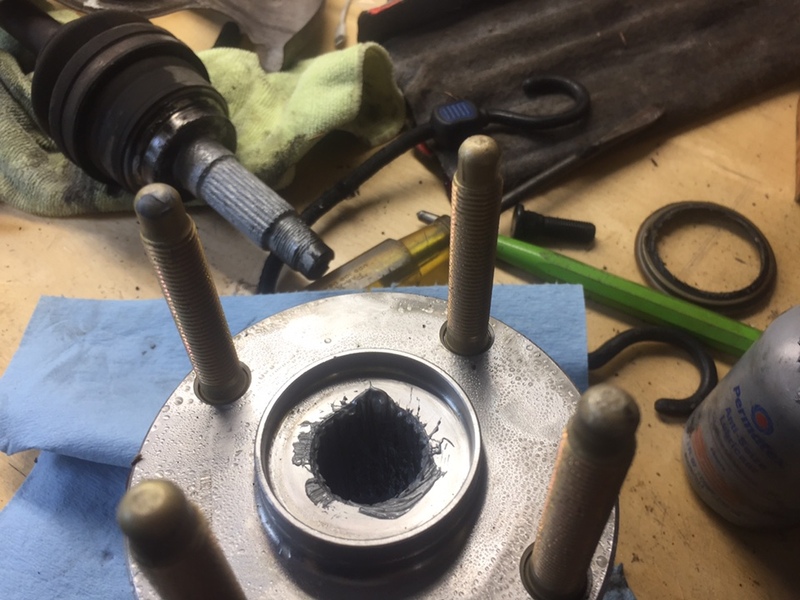 I used a 36mm socket to support the bearing’s inner race. 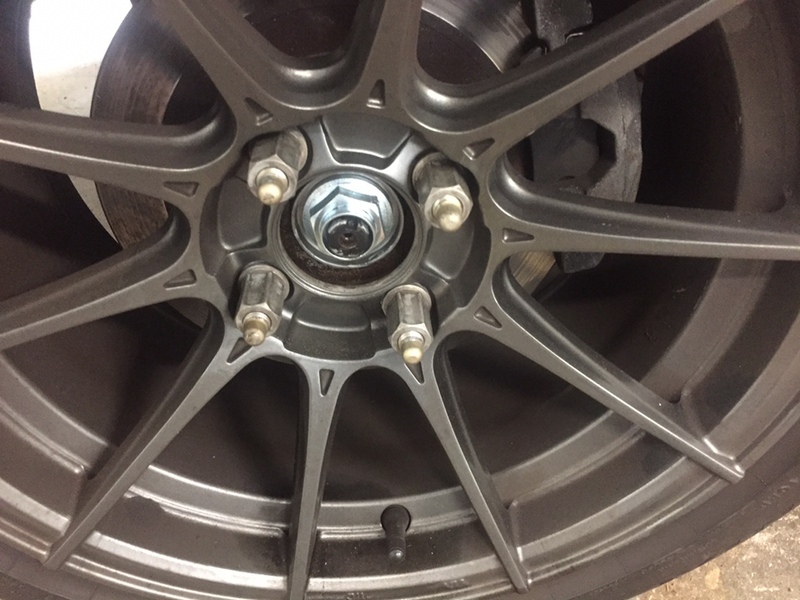 Note the frost on the hub and studs. All done! 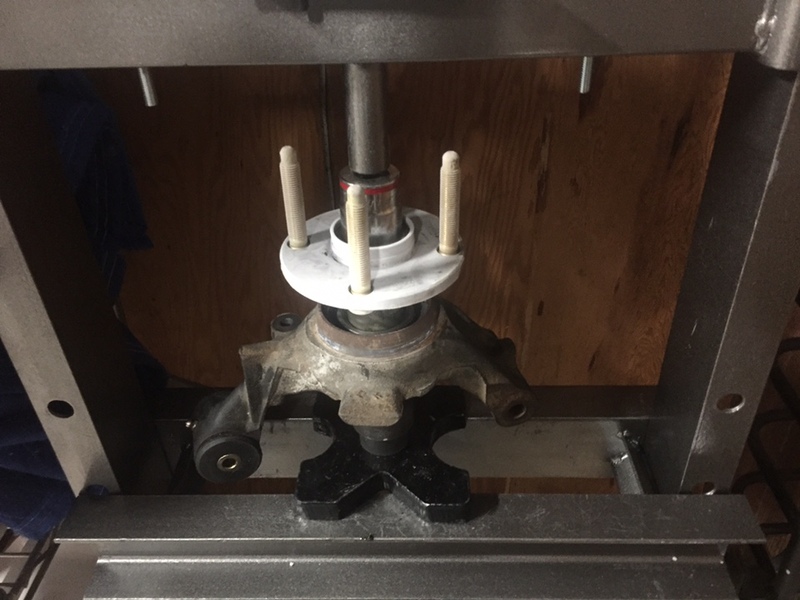 Applied anti-seize to the splines of the new hub too. 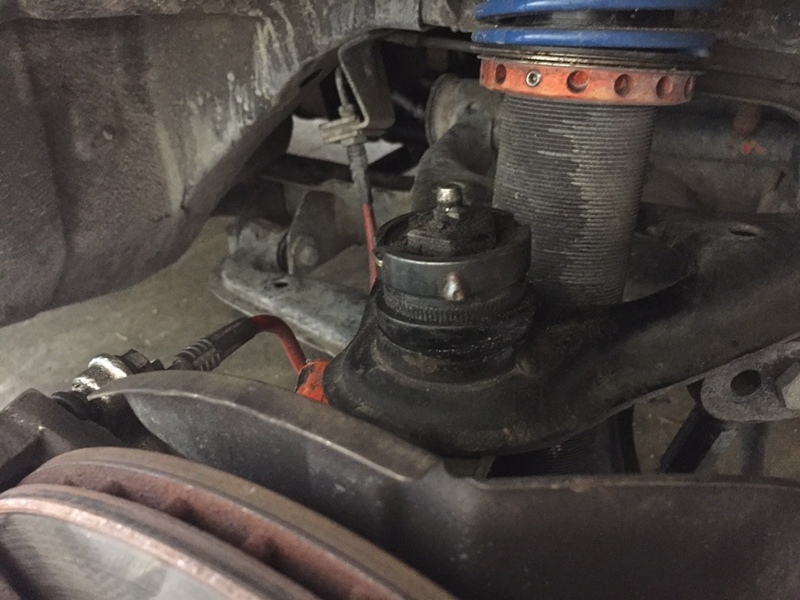 The sticky axle slid right in and I captured it with the new axle nut until I installed the assembly back in the car. 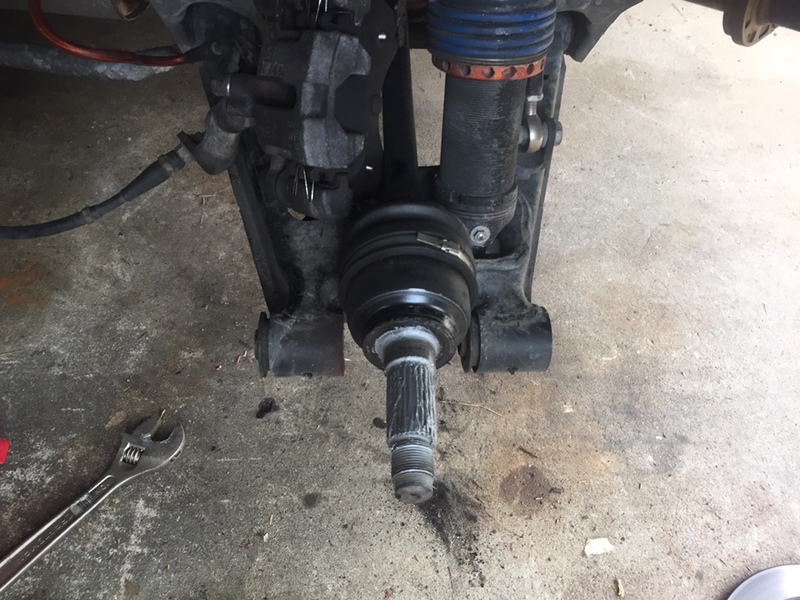 Hung the knuckle, popped the axle back in the dif, reinstalled the rotor and caliper. 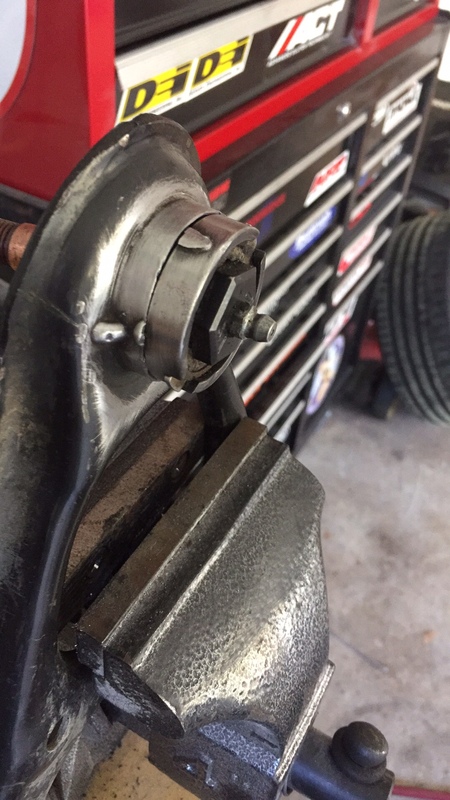 Punched the axle nut with an angled chisel to capture it. Complete! Time for the driver side, the REAALLY loud bearing. This one was easy as pie because I installed a new axle a few months ago. 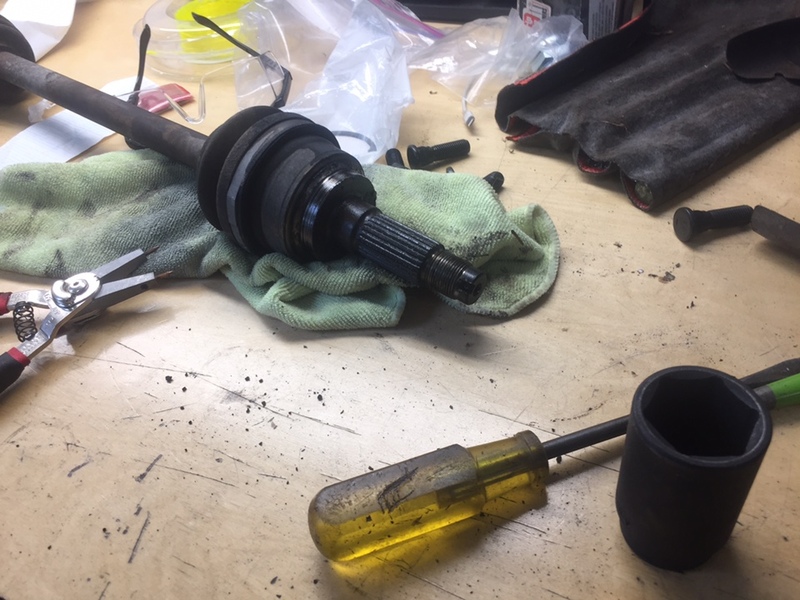 A few light taps with a regular hammer freed it from the old hub. Same process as before, this time a lot smoother. The lower left stud was probably nicked from being moved around the work area, it wasn’t threading as smoothly as it should. 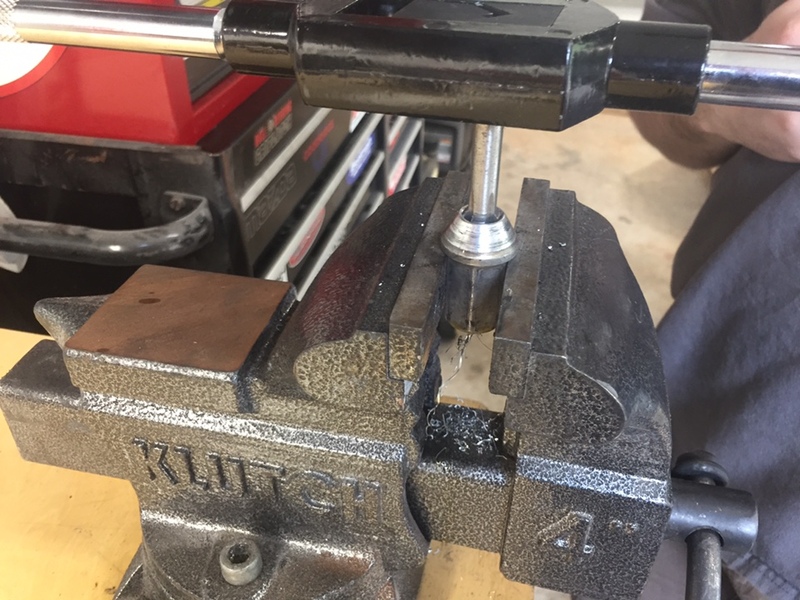 A buddy dropped by with his tap and die set to correct it. No big deal. 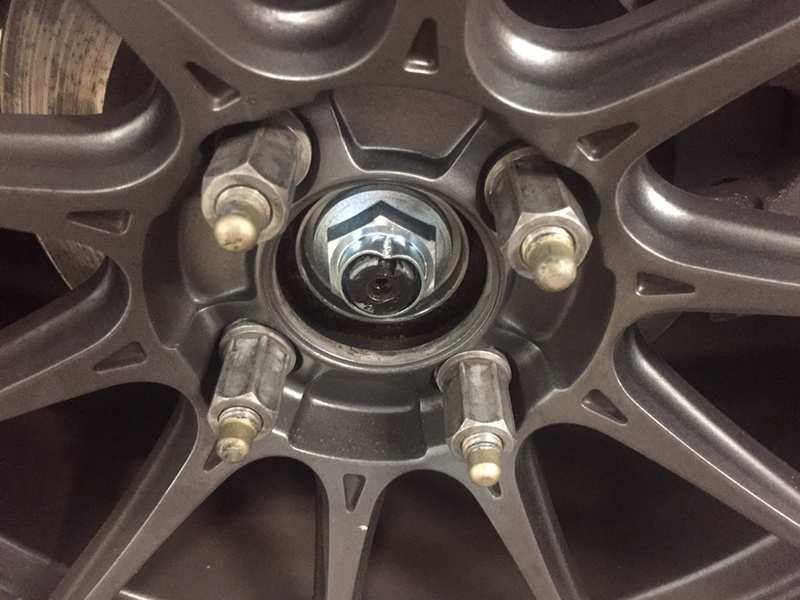 We chased the forged aluminum lug nuts while we were at it. Mission complete! It all took 4 hours. Much shorter than anticipated! These cars are loud, but the new hubs and bearings are sooooo_much quieter!